VANCOUVER (AFP) - Accused of sanctions busting and forced to abide by a curfew and wear an ankle bracelet as she awaits possible extradition to the United States, China's "Princess of Huawei" could be said to have fallen spectacularly from grace. But Ms Meng Wanzhou, heiress to her billionaire father's global tech conglomerate, is managing to surround herself with a few home comforts. Huawei's chief financial officer was arrested on Dec 1 on a US warrant for alleged sanctions-breaking dealings with Iran, while changing planes in Vancouver. She faces more than 30 years in jail if convicted, but was freed on C$10 million (S$10.3 million) bail on Tuesday night (Dec 11) pending the outcome of an extradition hearing, which could take months, or even years, if appeals are made in the case. The following morning, Ms Meng was spotted by AFP answering the front door of her Vancouver house to three visitors bringing flowers who arrived in a sedan with diplomatic plates. Later, Ms Meng stepped out to offer reporters slices of pizza that she had ordered in (they politely declined). 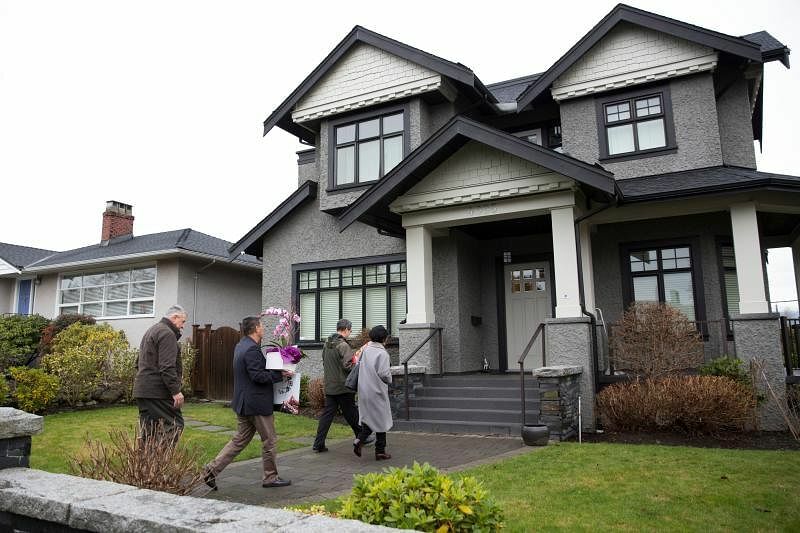 In 2009, Ms Meng's husband Liu Xiaozong bought the six-bedroom house where she must stay in Vancouver's Dunbar neighborhood - a leafy quiet enclave of single-family homes a few blocks from an urban forest. Although valued at a hefty C$5.6 million, the house - on a large corner lot with a view of the Pacific coast city's majestic north shore mountains - does not stand out as particularly ostentatious. Ms Colleen McGuinness, who lives in the neighbourhood, said the reaction to the executive's arrival has been muted. "I don't think I'll see her at the grocery store," Ms McGuinness told AFP. "She's obviously been here before, she's just another person in the neighbourhood, but with a bit of an entourage." Ms Meng's husband Liu resided at the 28th Avenue home up until 2012 while working on a master's degree, and the couple's young son attended a local preschool. Ms Meng's in-laws have also spent several summers at the house, and her mother and eldest son visit too. "While my work obligations have typically required that I travel extensively, I always try to spend at least two to three weeks in Vancouver every summer," she said in court documents. The couple bought a second home in the Shaughnessy neighborhood worth an estimated C$16.3 million. It is currently being renovated. Ms Meng's case has divided the Pacific coast city's large Chinese-Canadian community. "I was surprised at the amount of vitriol I'd gotten from supporters of Meng, saying she should be released," Mr Justin Fung, whose parents immigrated from Hong Kong in the 1970s, said on Twitter. Speaking to AFP, Mr Fung said the controversy, however, is not likely to affect Ms Meng directly: "We're a pretty low key city, we routinely get Hollywood stars come through and people are not badgering them." While on bail, Ms Meng is required to wear an electronic anklet, and a security team paid by her has been assigned to monitor her movements in Vancouver. She also has an 11pm to 7am curfew. Speaking through her lawyer, Ms Meng sought to put a brave face on her situation - saying she looked forward to spending time in Vancouver with her family, and maybe applying for a doctorate programme at the University of British Columbia while the extradition case plays out. Her lawyer, Mr David Martin, argued that she was not a flight risk because it would otherwise "embarrass China itself". Ms Meng also cited health reasons for requesting bail. "I have been working hard for 25 years and if I were to be ordered to be released, my only simple goal is to be with my husband and my daughter," she said. "I haven't read a novel in years." As CBC News commented: "She may have time to finish War and Peace, Anna Karenina and the complete works of Marcel Proust before her extradition odyssey is done."